Marketing has evolved drastically in the last few decades. Businesses spend on marketing activities in both traditional and digital mediums to drive their message to the target audiences. If you are new to business and about to initiate marketing strategies, it is important to know the pros and cons of both these marketing channels. Let’s know about traditional marketing and digital marketing in detail. Every advertisement in mainstream media including TV, newspaper, magazines, postcards and billboards falls under traditional marketing. It is a medium where you can convey your brand message loud and clear. In short, traditional marketing is an outbound strategy. In traditional marketing, hard copies of the advertisements can be retained. We can reach out to more people in less time. For instance, if you have a full-page ad in a leading newspaper, you are reaching out to their entire subscribers, the next day morning. Another advantage of traditional marketing is that, the messages are clear and easily understandable by the audience. Though traditional marketing has long been in the industry, this methodology does not allow prospects to interact for knowing their feedback. The marketing campaigns, especially TV commercials are expensive to run. Ironically, it is hard to measure the results, such as how many have really bought the products based on the ad campaigns. You may have had a good idea about traditional marketing, its advantages and disadvantages. Now, let’s discuss about digital marketing. Now, digital marketing is an inbound strategy where target audience are reached out via the internet. The engagement level here is multifold because prospects can rate your product and also provide feedback that everyone else can read and decide accordingly. Digital marketing is cost-effective. When compared with traditional marketing, Google Ads and other digital ad campaigns won’t cost much to run periodically. Secondly, audience can directly interact with your ads in digital space. It can gather prospect’s contact information. Further, there are web tools that can accurately measure how effective the digital marketing campaigns. Real-time feedback could be challenging especially when there are so many users online and are seeking for additional information or services. Secondly, digital ads may not reach all target audiences. Ad blockers and other tools can block ads from getting displayed in browsers. Campaign emails can end up in spam folder. Many may simply ignore digital campaigns altogether. Considering the penetration of smartphones and high-speed mobile internet, the next decade will likely be dominated by digital marketing and it is safe to say that, for effective brand reach, it is wise to invest more in digital over traditional mediums. Here are a few reasons that favor digital marketing. Where digital and traditional marketing merge? 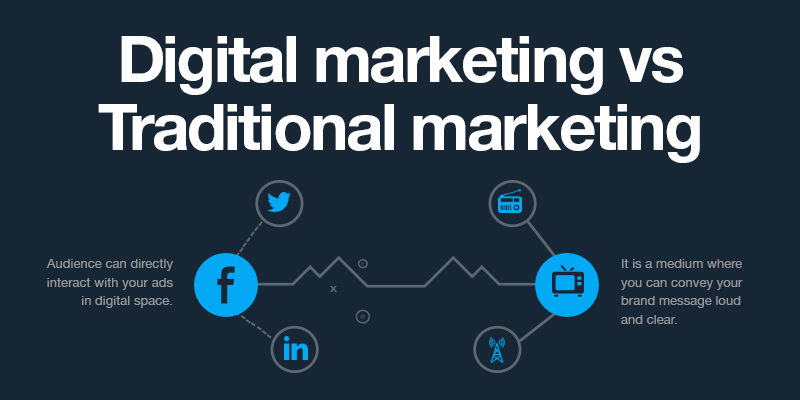 Transition from traditional marketing to digital marketing is happening for sure. Technologies like QR codes help link a newspaper ad with a mobile app bridging the gap between the physical and digital mediums. With the introduction of Augmented Reality, users can get more personalized. Digital marketing has measurable tools that allow us to know the effectiveness and the scope to change the strategy during unfortunate circumstances. Secondly, digital marketing costs far less than a typical traditional marketing expenses. Subscription models in digital campaigns help focus on the target audience far better which increases conversion rates. Real-time analysis of the marketing efforts help improvise the strategies on the go. Besides, digital marketing is interactive that helps fetch customers’ data and target marketing campaigns directly. Currently, we are in a stage where digital marketing seem to overtake traditional marketing in cost-effectiveness and measurable results. While every marketing strategy has its own pros & cons, to effectively reach out to target audience, we need to choose the right strategy. For old and traditional audience, traditional marketing may work out. But if you are targeting the youth, especially, the millenials, make sure to allocate more budget for digital marketing.